High-energy (MVC, fall from height) or sports injury. Seven tarsal bones: calcaneus, talus, cuboid, navicular, medial, middle, and lateral cuneiforms. CT scan indicated after reduction. -more common than lateral; 75% of subtalar dislocations. -Usually can be reduced closed. If no fx or defects are seen on post-reduction xray ---Treatment = closed reduction (with sedation / spinal anesthetic) followed by CT scan. Reduction manuever = knee flexion (held by assistant), Longitudinal traction applied to foot/heel with foot in plantar flexion. Slight accentuation of deformity with pressure on the talar head. SLC for 4 wks. Late instability is rare. -Irreducible medial dislocations are caused by the talar head "buttonholed" through the extensor retinaculum or extensor digitorum brevis; can be blocked from reduction by an interposed short extensor muscle, deep peroneal neurovascular bundle, peroneal tendon, or talonavicular joint capsule; or can become impacted on a sharp border of the navicular. -High energy, frequently associated with small osteochondral fx. -Less common then medial subtalar dislocations. -Treatment = closed reduction (with sedation / spinal anesthetic) followed by CT scan. The reduction maneuver involves longitudinal traction, hyperpronation and lastly supination. The knee should be flexed and an assistant should supply countertraction under the thigh.Large fragments should be fixed, small fragments excised. -Irreducible lateral subtalar dislocations caused by posterior tibial tendon (most common), flexor hallucis longerus, flexor digitorum longus tendons onto the lateral neck of the talus or by impaction fractures around the talar head. -Lateral subtalar instability: if fails conservative treatment calcaneofibular ligament reconstruction is indicated. 15% develop symptomatic arthritis. 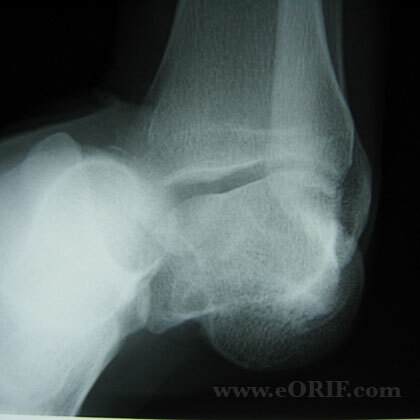 89% radiographic subtalar arthritis, 72% radiographic midfoot arthritis (Bibbo C, Foot Ankle Int 2003;24:158). Bohay DR, Manoli A II: Subtalar joint dislocations. Foot Ankle Int 1995;16:803-808. Bohay DR, Manoli A II: Occult fractures following subtalar joint injuries. Foot Ankle Int 1996;17:164-169.